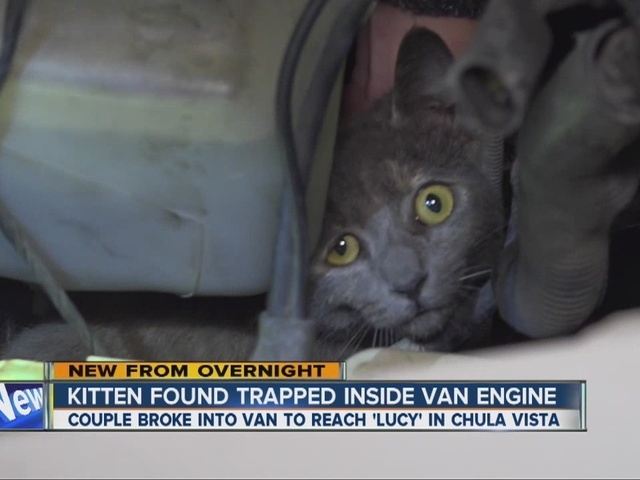 CHULA VISTA -- With the permission of police, a couple broke into a van to save their cat that was trapped in the engine early Wednesday morning. “Lucy” got trapped under the hood of a van in the 300 block of Tourmaline Court. Siboney and her boyfriend Martin went to a concert Friday night and left the cat with Martin’s brother. The cat somehow got loose and had been missing ever since. Late Tuesday night, they heard Lucy’s cries for help and discovered that she was stuck in a parked van a few doors down. They couldn’t immediately locate the van’s owner, so with a San Diego police officer looking on, at about 1 a.m. Wednesday, they jimmied their way into the van, popped the hood and found Lucy trapped in wires. They were able to cut her loose. Lucy is expected to be OK. There was no word if Martin and Siboney found the owner of the van.